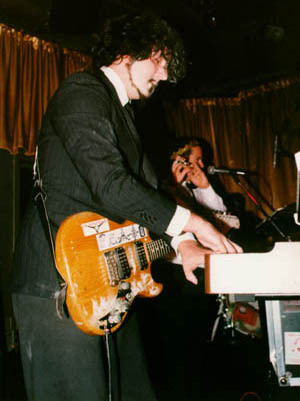 Trey Spruance (born in 1969 as Preston Lea Spruance III), formerly of Scourge back in 1985, with drummer Jed Watts formed Mr. Bungle with Mike Patton and Trevor Dunn. He writes a chock full of good material, like "Merry Go Bye Bye." Trey has worked on numerous projects with different bands he has created and different musicians. Here are some of them: Faxed Head, Faith No More, performed solo as the Noddingturd Fan, Millers Higher Life, and Secret Chiefs 3. Other projects he has started besides Bungle, SC3, and Faxed Head are the carnival/horror organ sounding FORMS and the black metal/techno sounds of The Holy Vehm. Also Trey reluctantly formed his own label, Mimicry Records, with worldwide distribution from Revolver USA. Trey is also working on an opera, titled Apokatastasis, which he has completed most of the libretto. He is currently attending Mills College in Oakland, where he is studying in their Liberal Arts program to obtain his Masters so he can fund his opera. FORMS: This is Trey's organ, carnival sounding project. He has two albums worth of material, and will begin recording the first album in October. Holy Vehm: Not much is known about this project, except that it will be a metal/techno project. Trey has said he plans to record this after the first FORMS album is done. Apokatastasis: This project will take a few years for Trey to complete, as this is an opera he has begun. He is working on the music, and has finished most if not all of the libretto.